Application portfolio management is nearly impossible to perform without an honest and thorough understanding of end user sentiment toward IT software. Develop data driven insights to help you decide which applications to retire, upgrade, re-train on or maintain, to meet the demands of the business. Get a full 360 view of the effectiveness, criticality and prevalence of all relevant applications, to get a comprehensive view of the health of the applications portfolio. Identify opportunities to drive more value from effective applications, retire nonessential applications, and immediately address at-risk applications that are not meeting expectations. Provide detailed application feedback to admins with a dashboard overview of each application to identify problem spots, develop action plans for improvement, benchmark successes from year to year and determine key departments with which to initiate discussion. Share end user satisfaction and importance ratings of core IT services, IT communications and business enablement to focus on the right end user groups or lines of business, and ramp up satisfaction and productivity. Info-Tech’s Applications Portfolio Assessment Program has been designed to be applicable to your organization, no matter your size or industry. Download a preview of the report to see the value that it can bring to your organization. View a sample of the short diagnostic. This simple-to-deploy questionnaire is designed to be quick and user friendly for end users, and deliver valuable insights for informed IT decisions. Get started now! 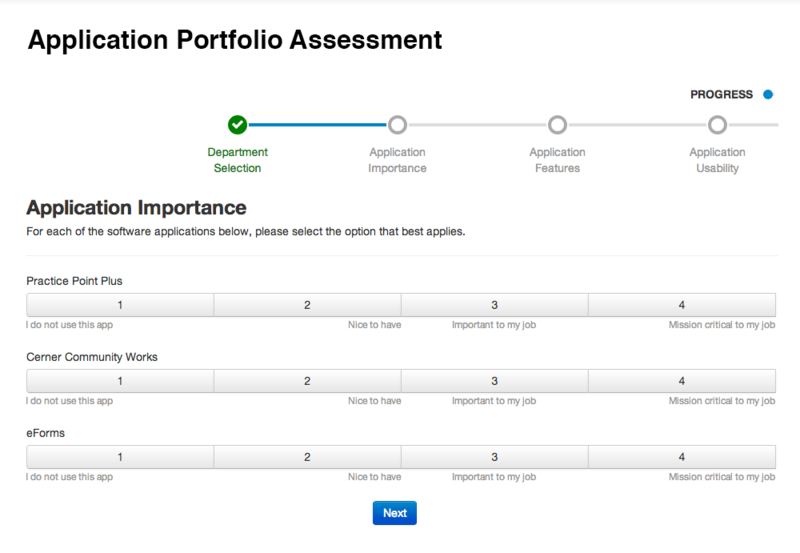 Create an inventory of applications to evaluate with this template. Get started now! Customize your emails with this template. Combine your Application Portfolio Assessment with our End User Satisfaction Program to capture end user sentiment on both satisfaction and your suite of applications. Info-Tech’s dedicated team of Program Managers will facilitate this Diagnostic program remotely, providing you with a convenient, low effort, high impact experience. We will guide you through the process with your goals in mind to deliver deep insight into your successes and areas to improve. * Please contact your Account Manager to determine eligibility. Info-Tech Research Group’s expert analysts will come onsite to help you facilitate this Diagnostic program, interpret the results, and help you start to implement change. We take you through the phases of this process and ensure that you have a road map in place to improve the areas highlighted in your custom report. * Due to the nature of this Diagnostic we may recommend that portions of it be initiated prior to the onsite engagement to allow time to complete it. ** USD, price for 5 day onsite engagement, limited to one location. Contact your Account Manager for global pricing. Scope of work may be adjusted after engagement commences. This was purely an investigation into the value such a report could provide to my company. I am very satisfied with the quality of the report, but cannot provide any accurate replies to the questions asked above. Best - The willingness of Info-Tech staff to assist; quality of the report. Worst - As with any survey-based data set, the accuracy of the data depends on the number of responses. In my case, I received a limited number of responses which casts doubt on the accuracy of the overall statistics. The analyst was well prepared and able to speak to all aspects of the report. It was easy to follow and informative. The setup was slightly confusing at first. Results were very informative, and the follow-up call helped explain the parts that were not immediately understandable. Best - great support from the program manager throughout the entire process. Worst - putting together the application listing for each of the 8 agencies was a logistical challenge, but next year should be smooth. Dollar value estimate is difficult since we have no previous experience conducting a survey of this magnitude. Best experience: turnaround time of final report and summary session. Worst experience: getting the survey question wording correct. Great information and insight. I wish there was a way to get more participation. Great information - very timely and professional. Worst - did not have the comparison report at first; had to wait for it to be programmed. Good concept and capable product, but a little too inflexible in configuration. Best - This is a very valuable first step in our new IT department making appropriate steps to support the business based on this feedback. It also is educating my management peers on the importance of things like this to the overall IT organization. Info-Tech did an excellent job of assisting and then evaluating the survey. Worst - Not to any blame of Info-Tech but it took a very long time to get the survey out and done from the first time we talked. This was due to ATI delays, but unfortunately it impacted the overall value. Excellent methodology for evaluating the performance of the IT department; lots of good information reported and analyzed in a wide range of formats; good classification scheme. Maintaining the anonymity of the participants is a challenge and can lead to some distorted results. Overall a very good experience. I don't know how to quantify the value. I can see there was a lot of behind the scenes work being done. I would guess anywhere from a $1k to $3K depending on how many others may have been on the team and what the going rate is for consulting. The best part was the survey combined with the support from Sid Wilson in configuring it, and the analyst call afterwards to walk through the report. The worst aspect of this engagement was the internal coordination, i.e. who to send the survey to for which applications and then having only 1 in 4 complete it. The worst aspect was that a few users got booted out of the survey when they were in the comments section. I sent the details to Alain. Another problem was that "Share this survey" was tacked on to the end of the survey. Finally, for the ranges of Very Satisfied to Not at all Satisfied, the text was on top of one another so it couldn't be read. It seems that if some QA had been done, this would've been caught and fixed before it was sent to us. The best aspect was working with Alain. He was the utmost professional and very understanding with my questions and schedule changes. Another great aspect was not having to do all of the work of putting together the actual survey. The final analysis was first rate and it was wonderful to see the data graphics to fully appreciate what our customers were saying. Best - Excellent summary of information/results. Best - Info-Tech made the process very easy and not time consuming. Worst - Questions being aligned better with our situation/environment. Worst - No Executive Summary to assist with presentation results to non-technical Executive Team. Excellent experience. The results reinforced our impression and the feedback we have received. We can leverage this data when building a case for additional investment in some of our critical business systems. Very useful, detailed, and insightful. Best - Gives me new perspectives on application and data benchmarking that the self-developed IT satisfaction surveys conducted in the past lacked. This allows for a more focused and constructive assessment of issues than past surveys have offered. The time and cost estimates provided scope of an approximate level of effort to have added these capabilities to my former survey. Worst - Lost a key data point that my self-developed IT survey tracked, requiring the survey taker to estimate the percentage of their normal work tasks that required IT services to perform. This was extremely useful information to help justify large-scale IT investments in shared infrastructure equipment and risk reduction (in our case, last year 87% of staff used IT services for 50% or more of their job). I urge Info-Tech Research Group to consider including a similar question in future surveys (I'm happy to share my example and results). Your staff is very knowledgeable and responsive. For this particular project I don't see any negatives. Guided approach is great. Liked having the best practices to go with the before and after discussions. I was very pleased with the comprehensiveness of the results we got out. Setting up the survey took a little longer than I expected. In retrospect, there are several apps I wish I'd included in the survey that I accidentally left off, which is my biggest regret. Alain Ducharme was great to work with. The existing Info-Tech survey structure was not robust enough for our needs. Alain is working with his peers to hopefully update the weakness for future surveys. User survey allows me to gather information I might not otherwise get. Ease of setup, administration, and report generation were the best. There was a small hiccup with the setup process and the relational nature of the tables did not show some information. We did get it fixed before it was sent out.